Unlike Star Wars, which must never ever again be mentioned in the context of Christmas, ever, Star Trek remains comparatively unblemished. Memory Alpha lists the various appearances of the holiday in the series, and I note with unblemished joy the total absence of the words "Holiday Special", "Planet of the Wookies" or "weird, surrealist dance numbers". All as it should be. 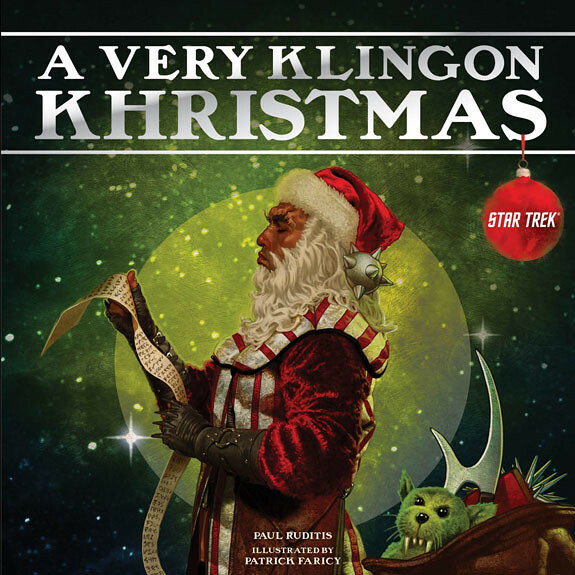 What Star Trek has produced, however, is a a short picture book about Khristmas. Link takes you to a gallery of the art and text of the book, leaving what I am about to write largely superfluous. I link to it in full confidence that you will not leave me for prettier pastures. May I also add that I would really quite like to own that evil-looking teddy, pretty please? This is not the first Klingon/Christmas crossover (I direct your attention to A Klingon Christmas Carol), but today's text has thankfully been translated into English and is therefore more easily accessible to those of us who have made the wrong priorities growing up. to return on a star. In Star Trek VI: The Undiscovered Country the Klingon Chancellor Gorkon stated that "You have not experienced Shakespeare until you have read him in the original Klingon", and people have of course followed that to its natural conclusion: The Klingon Shakespeare Restoration Project has, through much toil and trouble (I imagine) produced a Klingon edition of Hamlet. If you are terribly confused at this point, wondering what this Klingon thing is, I direct you to the Klingon Language Institute for your present edification. of who's naughty and nice. that will help clear the way). nor the chimney will do. were all truly for naught. Because the episode "Trouble with Tribbles" now makes perfect sense. carving up the roast beast ... er ... targ. and the berries shine redly. a plant that's so deadly. With a shout of "Qapla'!" his sleigh quickly departs. Coordinates set on his private star charts. "Happy Khristmas to all, and to all a maj ram!" Maj ram, if you did not guess, is Klingon for "good night"; making the last line echo the parting words of another Santa Claus. This is not the only English/Klingon code switching in the book. One page gives the lyrics of the traditional Klingon drinking song, which translates into English as roughly "And the blood was ankle deep./ And the River Skral ran crimson red./ On the day above all days. /When Kahless slew evil Molor dead." -- I assume we cannot be surprised if the Klingon association of the colour red with Khristmas springs from rivers of blood (though I thought Klingon blood was supposed to be pink). Should you make your children read this? Yes, of course you should. They will need a good cultural foundation before getting to grips with A Klingon Christmas Carol and the Klingon Hamlet later in life. Hver gang leser jeg det med beams som et substantiv, ikke et verb, og da blir flyten helt feil. Den siste linjen manler ett. beam him RIGHT through to YOU. Jeg må tenke på dette. Man sier vel transPORTer, egenlig, ja.